“Whether” something needs to be done. But the most difficult questions of all, the ones policymakers inform us they find most vexing, are “How” questions, for these, unlike most of the others, cannot be answered with a yes or no. Rather, the answer to each comes with a cost. Sometimes the cost is political, as when leaders of an administration’s political party or a government’s most important advisers or constituents are certain to put their foot down and say no. Sometimes the cost is financial, as when it is pointed out that there are no funds allocated, authorized, or appropriated for that which is recommended. Sometimes the cost lies in having to admit that the requisite competent human resources to implement a policy recommendation simply do not exist. Sometimes the cost is one of technology, equipment, and/or structures or systems that do not exist or, if they do, would have to be transferred from where they are to where they are needed more at what, arguably, is a prohibitively high cost in terms of time, effort, and money. Sometimes the cost is in credibility, as when an administration or government is on record as being strongly opposed to exactly what someone has just recommended as a solution or a palliative. Sometimes the cost is moral in the sense that it clearly violates the Golden Rule of Do Not Do Unto Others What You Would Not Have Others Do To You. Sometimes the cost will likely be a sharp downturn in the public approval rating of a president, premier, or head of state. Sometimes the cost might be a definite setback to the country’s image and the degree of trust and confidence it seeks to cultivate and maintain among its allies. With this as background, context, and perspective, there follows a series of questions relating to contemporary Arab-U.S. relations. The questions are ones that policymakers on one side or another, and sometimes both sides, grapple with daily. They are provided in the spirit of a public service. To whom? To not only the policymakers entrusted to improve Arab-U.S. relations and not make them worse. They are also offered as food for thought. Again, to whom? To intellectuals, scholars, teachers, students, analysts, investment strategists, specialists in public policy research institutes, and many others eager to enhance their knowledge and understanding of the state of play in the relations between the United States and the Arab world, and who want to improve these relations. How will U.S. relations with the Arab oil and gas producing countries change were these to shift to closer coordination in the energy sector with Russia as a major oil and gas producer? 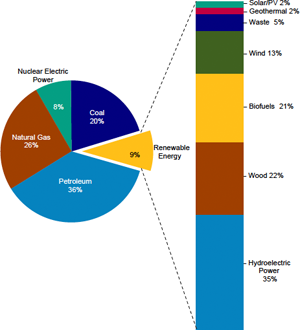 Renewable Energy as Share of Total Primary Energy Consumption, 2011. Source: U.S. Energy Information Association. How can the U.S. renewable energy industry benefit from the drive of Gulf countries toward clean energy production? How, if at all, can Arab oil producers in OPEC and/ or OAPEC determine what pricing mechanisms help serve the overall health of the American and global economy? How can U.S. and Arab companies best coordinate their efforts to invest in and develop Africa’s energy sources and thus compete with China’s similar efforts in the continent? How can the United States help Lebanon and Syria in exploiting the oil and gas reserves discovered across their Mediterranean shore? How can one best envision an amicable resolution of the competing claims by Israeli and Palestinians to the allegedly immense gas reserves reported off the coast of the Gaza Strip? How can the United States help the Iraqi central government and the Kurdish Regional Government arrive at an equitable and fair distribution of the country’s oil wealth? How can the U.S., if it so desired, coordinate with Arab oil and gas producers, should they also wish, to lift the threat of a cutoff of Russian oil to Europe as a response to the rising tensions between NATO countries and the Russian Federation over Ukraine? How can the U.S. prevent the potential collapse of the oil industry in Libya as a result of the ongoing political turmoil and deteriorating security situation? How can U.S. companies assist in a pan-Gulf energy grid or a future pan-Arab energy grid if decided? How can the United States participate in an international coalition that would help settle the political and security situation in Libya? 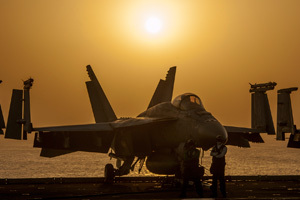 A U.S. Navy F/A-18E Super Hornet aircraft sits on the flight deck of an aircraft carrier in support of Operation Inherent Resolve against the militant group the Islamic State. Photo: U.S. Department of Defense. How can GCC countries overcome congressional opposition to deploying high-end American defense assets in the Gulf even if satisfactory security arrangements are made for such assets to be monitored by US personnel? 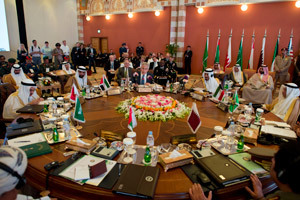 How, given the frequency with which media pundits and Members of Congress lambaste the GCC countries for allegedly not doing enough to help ensure their own defense, ought one to analyze and assess the implications for American and other international interests of the unprecedentedly large and diverse display of pan-GCC defense cooperation in military maneuvers involving tens of thousands of GCC armed forces personnel in Saudi Arabia earlier this year? How can one evaluate the nature and extent of GCC and other Arab countries’ contributions to the campaign to contain, if not roll back, the advances in Iraq and Syria of the Islamic State in Iraq and the Levant? How can one measure the importance of U.S. military sales to GCC countries to the overall health of the U.S. economy? How can the United States facilitate the acquisition by Iraq and Yemen of armed drones for use in their battlefields against violent extremists? How might the United States help GCC countries in overcoming their inadequate military coordination and interoperability concerns? How can the the United States augment its maritime presence in the Arabian Gulf as its military budget shrinks and visits by naval assets decrease to the area? How likely is it that the United States might withdraw from or downsize its Gulf bases in Qatar and Bahrain and compensate for them by augmenting its presence in Djibouti or elsewhere? How will the United States allay the security fears of its GCC partners and allies as it seeks in various ways to open up to Iran, considering their apprehensions about Iranian meddling in their affairs and those of other Arab countries? Secretary of Defense Chuck Hagel speaks at the Gulf Cooperation Council Defense Ministerial in Jeddah, Saudi Arabia, in May 2014. Photo: U.S. Department of Defense. How has the Obama Administration’s defense strategy to re-balance East Asia and the Pacific affected its relationship with the GCC countries? How can any damage to the strategic relationship be undone? How can the GCC as an alliance face up to the challenge from the Houthi militia to the Yemeni government as Yemen approaches establishing its vastly reorganized federal administrative and legislative structure? How likely and quickly will the GCC resolve any remaining issues in the rift within its ranks earlier this year that prompted the withdrawal of the Saudi Arabian, UAE, and Bahraini ambassadors from Qatar? How can the GCC collectively help re-organize political life in lands beyond its borders with a view to helping restore security and stability in the Arab world? How likely is it that the GCC will find the right political formula to resolve such issues as the monetary union, insufficient military coordination, and slightly divergent, if not on some issues opposing, foreign policies? How might a nuclear deal that would allow Iran continued enrichment but deprive it of stockpiles of highly-enriched uranium be regarded by the GCC? How likely is it that the GCC announce a collective or individual member-state nuclear effort if negotiations with Iran fail to reach an agreeable settlement? How likely is it that GCC countries and Egypt could arrive at a coordinated defense policy that would involve Egypt in the strategic defense of Gulf countries? How might that coordination, should it occur, be expanded, if possible, to include Jordan and Morocco? How will the United States’ commitment to the defense of Israel impair its political and military relations with GCC countries? 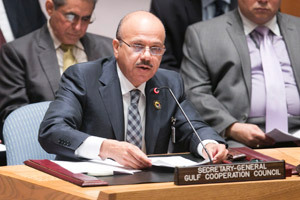 His Excellency Abdul Latif bin Rashid Al Zayani, Secretary General of the Gulf Cooperation Council, addresses a meeting of the UN Security Council on the situation in the Middle East concerning Yemen. Photo: UN. How might efforts at furthering intra-GCC relations help improve the prospects for the idea of a GCC Union? How might the GCC union idea develop in the future? How might GCC countries’ involvement in Syria be coordinated to help moderate forces in the Syrian opposition? How, if at all, given the fact that two GCC countries back separate and opposing factions in strife-torn Libya, can the GCC Secretariat coordinate GCC action in Libya to help settle the political and security situations in that country? How can the GCC countries collectively coordinate to protect themselves from any possible expansion of the Islamic State’s activities or the resurgence of al-Qaeda and its possible incursion into Saudi Arabia from Yemen? How is the still relatively new GCC-U.S. Strategic Dialogue likely to play out in the near term? How can Egypt re-cast its relations with the United States now that President Abdel-Fattah al-Sisi is re- establishing stronger military ties with Russia? 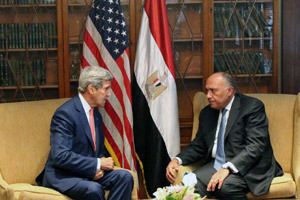 U.S. Secretary of State John Kerry meets with Egyptian Foreign Minister Sameh Shoukry, in Cairo, Egypt, in September 2014. Photo: U.S. Department of State. How possible or credible is it that the United States might limit or even suspend its military assistance to Egypt? How is Egypt likely to return to playing a central role in Arab politics? How can it leverage its relations with GCC countries to help that process? How will the Egyptian government deal with the continuing arrest and detention of the leaders of the now-outlawed Muslim Brotherhood? How much influence does this have on relations with the United States? How can the reported plan to build a new Suez Canal help Egypt’s economy and international trade? How involved will American companies likely be in building it? How likely is it that the United States will play a decisive role in assisting Libya end the turmoil engulfing it? How can the United States and Egypt face down the violent and extremist Islamist militias in control of Libya’s capital and other areas? How will the United States help Algeria build the credible institutional infrastructure that can help chart its political future? How should the United States work with regional actors and European countries to stem the flow of violent extremists and arms across northern Africa? 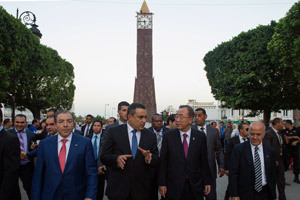 UN Secretary-General Ban Ki-moon visits 14 January Square in Tunis, with Mehdi Jomaa, Prime Minister of Tunisia, and Mongi Hamdi, Minister for Foreign Affairs. January 14th marks the day that then-Tunisian President Zine el-Abidine Ben Ali stepped down from power in 2011, as a result of the country’s “Jasmine Revolution.” Photo: UN. How can Egypt resolve its water problem with Ethiopia, now that the latter country’s Renais- sance Dam is being built on the Nile with inter- national assistance? How can Egypt assure itself of sufficient water resources for its livelihood and future development? How likely is the United States to become further involved in resolving the dispute between Algeria and Morocco over the Western Sahara? How likely is it that a coalition of willing North African partners can be built to deal with the problem of al-Qaeda in the Islamic Maghreb? How can Tunisia resolve the problem of radical extremists on its soil and how can it prevent Tunisians from joining the ranks of jihadist organizations fighting in Syria? How will Tunisia’s democratic development influence political dynamics in neighboring countries? How can Tunisia’s political leaders play an influential role in determining the outcome of such dynamics? 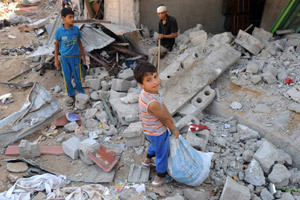 Palestinians searching the rubble of destroyed homes in Khuzaa, east of Khan Younis, Gaza Strip, in August 2014. Photo: Shareef Sarhan/UNRWA Archives. How will the Gaza Strip be rebuilt after the latest Israeli onslaught that destroyed so much of its infrastructure, social services, and civil society? How likely is it that the Arab Peace Initiative of 2002 will be revived? How likely is it that its terms may be changed? How will the latest, and possibly future, ceasefire agreement negotiated by Egypt between Hamas and Israel be implemented? How likely will there be enough pressure on Israel not to renege on its obligations in the ceasefire agreement? How, and to what extent, can the United States participate in an international peace-keeping effort that would be part of an overall peace deal between the Palestinian Authority and Israel? How likely is it that the Palestinian Authority and President Mahmoud Abbas lose upcoming elections in both the Gaza Strip and the West Bank, allowing Hamas to be the sole legitimate representative of the Palestinians in any future negotiations? How might this impact possible future negotiations? How might the Palestinian Authority pursue joining international inter-governmental organizations as representative of the ‘State of Palestine’? How will the international community deal with that possibility? How likely is the Obama Administration to oppose the aforesaid possibility if it found a unified and strong Arab push toward realizing such a goal? How can the Lebanese government and security forces deal with the possibility of unrest and even armed conflict instigated by extremists in Palestinian refugee camps? How will mainstream Palestinian organizations respond? 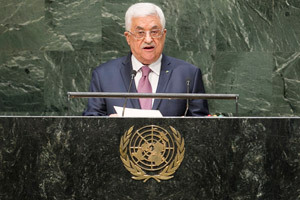 Mahmoud Abbas, President of the State of Palestine, addresses the general debate of the sixty-ninth session of the General Assembly. Photo: UN. How will the Palestinians, Egyptians, and the international community manage the Rafah crossing point with Egypt? How might other parties, such as Morocco and Jordan, be involved? How can the Palestinians strengthen their national unity and how likely is it that Hamas will allow the Palestinian Authority back into the Gaza Strip in any substantive way? How possible is it to still think of a two-state solution for the Palestinian-Israeli, and Arab-Israeli, conflict? How can the principle of withdrawal to the 1967 borders, in keeping with UN Resolutions 242 and 338 as well as the UN Charter dictum about the inadmissibility of the acquisition of territory by force, be realized to assure a contiguous Palestinian state given the Israeli facts on the ground in the West Bank and Jerusalem? How can Iran effectively re-engage with the world if nuclear negotiations that are scheduled to end in November do not lead to an acceptable deal? Relatedly, how can Iranian President Hassan Rouhani convince the hardliners in the government of the Islamic Republic that his diplomatic approach needs more time to work? 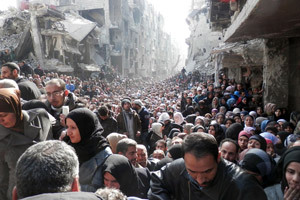 Yarmouk residents gathered to await a food distribution from UNRWA in January 2014. Photo: UNRWA Archives. How can the United States help implement the provision of UN Security Council Resolution 1701 that calls for deploying UN troops on Lebanon’s borders with Syria? How can the United States and the GCC countries loosen the grip that Hezbollah appears to have on the political process in Lebanon? How can they cooperate on limiting Iran’s influence in the country? How likely would a U.S.-Iraq-GCC coalition be able to roll back the gains that the Islamic State has consolidated in northern Iraq and northeastern Syria? How can they utilize the local assets and resources to achieve that goal? How can the United States devise a winning diplomatic strategy that helps Iraq’s divided political leadership achieve the unity needed to prevent partitioning the country? How likely it is that Iraq’s political leaders will soon agree amongst themselves to amend the Iraqi constitution to resolve flawed articles and unworkable arrangements? How can one reconcile what to many are essentially irreconcilable differences between Iran and the international community, represented in the P5+1 group, regarding uranium enrichment and stockpiles, nuclear facilities, delivery systems, etc.? How likely is Iran to continue supporting the Syrian regime if a nuclear deal with the international community were to be pre-conditioned on, if not abandoning then significantly decreasing the nature and extent of its support for, President Assad? How has the issue of killing American journalists in Syria galvanized and changed American public and official opinion about the civil war in Syria and American direct involvement against ISIS/ISIL? How has the American media’s role in exposing the suffering of civilians in Iraq helped to change official policy in the United States toward direct involvement in Iraq? 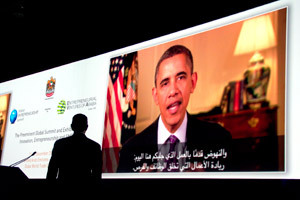 U.S. President Barack Obama delivers a video message at the Global Entrepreneurship Summit in Dubai, United Arab Emirates, in December 2012. Photo: U.S. Department of State. How and to what extent has the American media coverage of Israel changed, if at all, after Israel’s latest war on the Gaza Strip? How do Arab media outlets, specifically broadcast television, influence Arab politics? Essentially, how has the coverage of the Islamists’ rise after Arab uprisings played a role in intra-Arab rifts? How, and to what extent, will Arab media coverage of American policies in the Middle East effect a change in American-Arab relations? How has social media galvanized international public opinion about the plight of Palestinians in the Gaza Strip? How can that public opinion be harnessed to change American policy toward Palestinian national aspirations? How might GCC countries properly utilize their human resource assets to lessen the dependence on foreign labor and expertise? How might they devise alternative development plans that do not require a massive influx of manual labor? How can the United States help organize a large industrialization effort that can aid in diversifying GCC economies? A student works in a laboratory at the King Abdullah University of Science and Technology (KAUST). 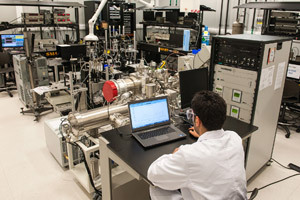 Photo: KAUST. How possible is it to increase trade and investment flows between Arab countries themselves? How can individual governments help break down bureaucratic barriers to such trade and investment? How can the League of Arab States be strengthened to play a major role in coordinating Arab economic cooperation? How will education and health issues in the Arab world affect the future of the region, and how will individual countries improve their human development indices? How might the ‘brain drain’ from the Arab world be stopped or at least decreased in nature and extent? How can the oil- and gas- rich Arab countries absorb excess educated talent? How will future GCC investments in the United States and Europe help in elevating GCC countries’ stature globally more than is already the case? How can the sovereign wealth funds of some Arab countries, or parts thereof, be utilized as development assets to be invested in poor Arab countries? How can the banking sector in some Arab countries be strengthened to play its role in helping economic development?